BirdCagePortal.com - Pet Bird Supplies, Parrot Supplies, Cages & Bird Products - What Is Cuttlebone? As a bird owner, I’m sure you’ve had someone recommend that you place a cuttlebone in your birds cage. Perhaps you’ve seen it in the store and wondered what exactly is this strange, solid-yet-flaky substance? As far as you may be aware, it’s a good source of calcium. Cuttlebone is indeed a bone. In fact, it is a hard, brittle internal structure found in cuttlefish (yes, they do exist!) The bone is composed primarily of calcium carbonate. If you have cuttlebone, you’ll notice how light it is and that it seems to have small ‘air holes’. This is because it is a chambered, gas filled shell that the fish uses as buoyancy control. In the past, cuttlebones have been used for numerous things such as: polishing powder, toothpaste, and antacids. Ever heard of sepia ink? That was a bi-product of cuttlefish as well. Like squid they expel a dark, almost black ink when threatened. Artists would gather this ink and use it for their paintings or drawings. But lets back up for a second. What exactly is a cuttlefish? Is it a fish, a squid, or just a really creepy looking animal that floats aimlessly around the ocean? Cuttlefish are actually not technically fish. They are marine animals in the order of Sepiida, belonging to the Cephalopoda class. This class also includes the cuttlefish’s close cousins, squid, octopuses, and nautiluses. Cuttlefish are said to be more closely related to your common variety garden slug, then an actual fish! Cuttlefish have an internal shell (the cuttlebone), large pupils, eight arms, and two tentacles furnished with sucker which they secure to their prey. What do they eat you may ask? Cuttlefish prey on mollusks, crabs, shrimp, fish, and even other cuttlefish. Their natural predators include: dolphins, sharks, fish, seals, and other cuttlefish. Interestingly, there are few cuttlefish species that are actually native to American oceans, most of which are living in the southerwestern Pacific Ocean. It is said that in areas where there are many native cuttlefish species, a person walking the beach can collect cuttlebones that wash ashore. Cuttlebone can be purchased at your local pet store. Different sizes of cuttlebone come from different species of cuttlefish, but no worries they all have the same nutritional value! 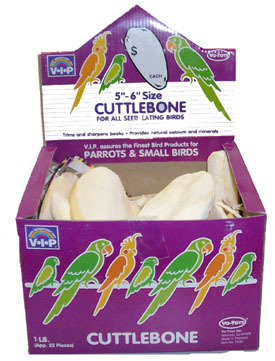 Cuttlebone is a very common way that pet owners get some calcium into their birds’ regular diet. Perhaps you have seen different colored cuttlebone in the store. Some companies flavor the cuttlebone and dye it hues of oranges, pinks, and greens in an attempt to make it more appealing and tasty. You may see different varieties of cuttlebone as well. Recently I’ve noticed that in addition to the dyed cuttlebone, companies have started incorporating a mineral block into the cuttlebone. I picked up a cuttlebone the other day that had a mineral block outer layer, and a cuttlebone inner layer. White is the natural color of cuttlebone, and one you most commonly see in bulk bins at your local pet store. Cuttlebone is readily available, I’ve even found cuttlebone at a country feed store. It is easy to come across, and an inexpensive way to introduce calcium into your birds diet.